Some of you may remember I went to an 'in conversation with' between Anthony Minghella and Sydney Pollack. And recently I was lucky enough to hear Minghella again at the launch of the Screen Academy. The academy has put up this article but I thought I'd pick out my own personal highlights. 1: There are no such things as acts. Follow the emotional story and the reasoning of your characters. 2: As a director you only get paid for your taste. Do not compromise. 3: The script (and remember he is a writer) is a guide to allow exciting things to happen. 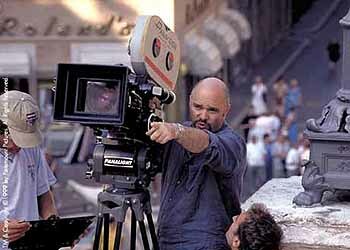 4: Directing is a balance between 'playing the game' and being an anarchist. Ask difficult questions. From the asking comes interesting things. 5: Why do we do all this? Why tell stories? Cinema and storytelling is there to smash the jail that we've put ourselves in. Very cool. I was part of a film network here in NYC called the Stellar Network run by his daughter Hannah. I know there's also one in the UK. Heard of it? I've not heard of that Will. But his family also makes great ice cream here in the uK. Now thats multi-talented! That's it - I'm off! Like the eye of a fly! I'm a writer - I write. New distribution - same old bean counters. That's how bad its got. Its like the blog - but live! Its Monday - so feel good!